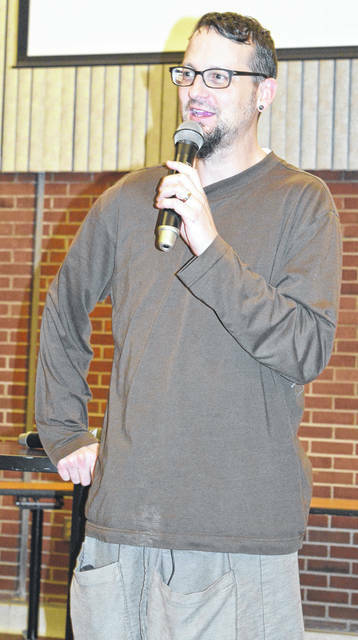 Christian social activist Shane Claiborne returned this week to Wilmington. WILMINGTON — In a presentation at Wilmington College, a Christian social activist said he’s proud of his city Philadelphia where townspeople have begun to create safe places for refugee families. All kinds of things separate human beings from each other, and there are lots of things we hide behind in fear, he said. And much of the world pulls us away from people who don’t look like us or differ from us, added Claiborne. He said he visited a community on the U.S./Mexico border where they practice hospitality and sanctuary, and there are lawyers helping folks with documentation. The people practicing the hospitality told Claiborne they believe this is a time when they need to be the prophetic conscience to their leaders. “We don’t wait for politicians in D.C. to tell us how to treat immigrants. We can read the Bible,” they said to him. When they do that, said Claiborne, they see the faithful are to welcome the foreigner as if they were your own flesh and blood because the people of the Lord themselves were once foreigners in the land of Egypt. It is time, as always, to let light shine in darkness, he said. When people are driven by fear, they do terrible things, said Claiborne. “So I think the real question is, ‘What would America look like if our policies were being driven more by love than by fear?’,” he said.